One of the least expensive and effective ways to increase the efficiency of your home or business is to install low-flow aerators on your faucets. These devices save water and result in lower utility bills as well, because less hot water is used. Because of this, low-flow aerators will generally pay for themselves in only a few months. 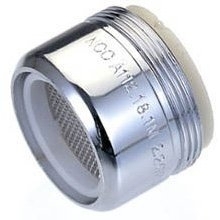 Standard faucet aerators will allow flow rates of 2.5 - 5 gallons of water per minute. But for bathroom faucets, low-flow aerators that deliver 0.5 to 1 gallon (1.9 to 3.8 liters) of water per minute will deliver the same force of spray, but often in a more pleasing fashion. Kitchen faucets may require a higher flow rate of 2 to 4 gallons (7.6 to 15.1 liters) per minute if you regularly fill the sink for washing dishes. If you tend to let the water run when washing dishes, the lower flow rate of 0.5 to 1 gallon per minute may be more appropriate. Some kitchen aerators will allow you to flip between two flow rates without affecting the water temperature. Select a manufacturer below to view products in this category.